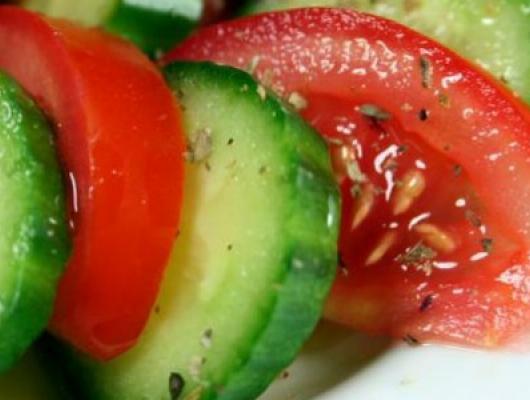 1.Arrange the cucumber and tomato slices in overlapping circles on a large serving platter. 2.In a glass measuring cup, whisk together the oil, lemon juice, cilantro, cumin, and pepper. 3.Drizzle lemon-oil dressing over the vegetables. 4.Cover and refrigerate until ready to serve. 5.If you’d like, add fresh bell peppers and onions to create a more substantial salad. Fresh tomatoes and cucumbers with a seasoned, citrus dressing.